My mother and I have shared experiences that revolved around the process of learning and creating something; something sewn, crocheted, or built using a variety of materials. This act of learning and creating together is a common tradition that binds the women on the matriarchal side of my family. My great-grandmother taught my grandmother and mother to crochet. Crocheting was a creative skill taught to encourage the creation of objects to decorate their small home in Guyana, but also as a skill that could help generate income. My mother taught my sister and I to crochet as a way of passing on familial traditions, but also as a way of forging opportunities for us to spend time being creative together. 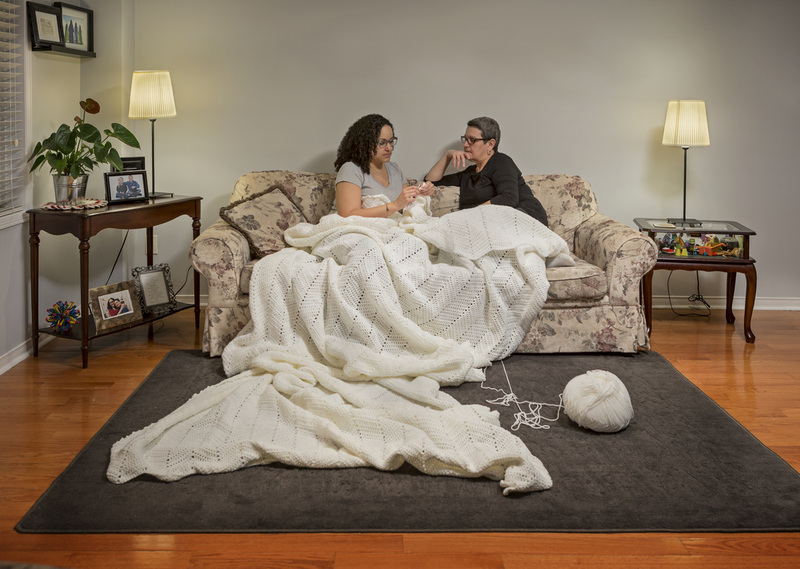 sometimes the metonymic object is an absence, is a white crocheted blanket that my mother and I created together over the period of a year, using the pattern followed to crochet the multiple blankets that are in our home. Every time we worked on the blanket, we would log our name, the date and the length of time spent crocheting. Sometimes we would crochet while sitting in the same room together - talking about the laborious nature of the process or about what was on television; other times, we would work on it alone. This blanket is an object that embodies our collective knowledge and our common diasporic history. It is a physical representation of our shared labour and our shared domestic space. The wool used to create this blanket is a string of thread that when reached it’s tail end, has been added to - where each knot, each loop, each chain created is a metaphorical placeholder for time. Accompanied by the monthly logs, sometimes the metonymic object is an absence will be placed in a space where viewers are invited to unravel the blanket and to log their name, the date and the length of time spent retracing the movements made by my hand and by my mother’s hand through the act of erasure. This process of unraveling encourages dialogue around concepts of time, loss, the displacement of memory and history, the relationship between artistic production and labour, and notions of conceptualism, minimalism and participatory art practices through the lens of culture, gender, and familial narratives. Multiple facets of migration are found throughout sometimes the metonymic object is an absence, whether it be my mother’s movement from Guyana to Canada, the transfer of skills from one hand to the next, or the physical relocation of this blanket from our home to Houston.